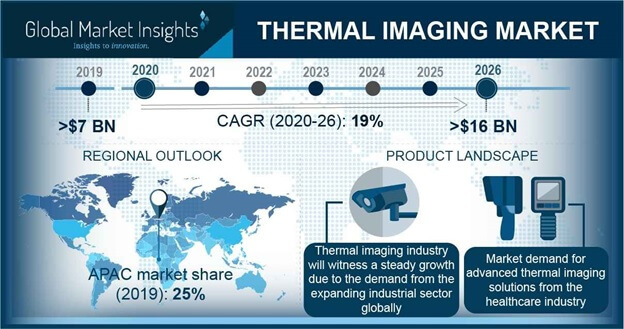 Thermal Imaging Market is set to exceed USD 10 billion by 2024; according to a new research report by Global Market Insights, Inc. The global shipments are set to grow at over 13% CAGR between 2018 and 2024. Thermography helps in the detection of fever and related signs of infection. Thus, the technology has been used extensively by airports during an epidemic outbreak such as Severe Acute Respiratory Syndrome (SARS), swine flu, and Ebola to screen passengers with elevated body temperatures. Hyperspectral imaging and remote sensing are expected to serve as the key opportunity domains for thermal imaging market expansion. Handheld/portable cameras constitute the largest segment accounting for over 50% of the market revenue share in 2017. Growing security concerns coupled with technological advancements, reduction in size, and an average selling price are the major factors driving the demand for handheld imagers. The ability of such devices to track, locate, capture, and record criminal activity in adverse conditions is expected to favorably drive the handheld thermal imaging market demand. Major vendors in the thermal imaging market space are FLIR Systems, Leonardo DRS, Raytheon Company, and Fluke Corporation. The market is characterized by stiff price competitiveness and innovative solutions. To sustain competition, players have been focusing on vertical integration to cut down input costs and developing technologically-advanced products. In addition, the expansion of product offering to penetrate new application verticals, such as smartphone integration offered by FLIR One and Seek Thermal Compact, enables vendors to garner additional revenue thermal imaging market growth opportunities. The integration of thermal camera cores into CCTV applications creates a bi-spectral camera solution that enables users to capture both visible image and thermal heat signatures for accurate surveillance and reduction in false alarms. The combination of thermography with other complementary sensing technologies, such as radar, laser, sonar, environmental, and chemical sensing, increases the functionality of the systems. Classification-based analytics and networking-enabled thermal cameras improve the response time for emergency situations while lowering the costs associated with the downtime and potential hazards contributes to the thermal imaging market.